Fastpacking route ideas in England, Scotland, Wales, Europe and Nepal. Inspiring stories of multi-day running adventures in the UK, Europe, USA and Asia. 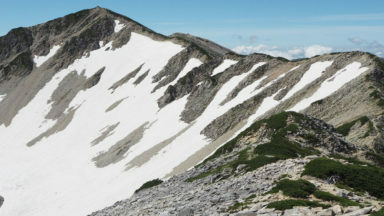 A summary of each route idea is provided, together with mapping and a gradient profile, as well as highlights, tips and 'tales from the trail'. Invaluable practical information is also included, covering everything you need to know to prepare and plan for a trip: training, accommodation options, safety, equipment, apparel, nutrition, hydration and more. The route ideas and stories featured showcase an impressive range of fastpacking opportunities, both in the UK and abroad. 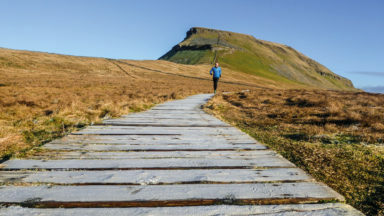 From mountain hut hopping trips, bothy discovery tours and wild camping expeditions, the inspirational tales and selected trails are guaranteed to entice 'everyday' runners to try their hand at a multi-day journey, be it in the Brecon Beacons, Bhutan or beyond. How do I train for fastpacking? Where should I go fastpacking? Route 8: Access to the Knoydart route is affected by the following landslide. An accessible introduction to an activity that’s a lot less intimidating than I’d previously assumed. The idea is simple: if you’re a backpacker, go faster. If you’re a runner, go further. What-packing? Fast who? You may well ask. 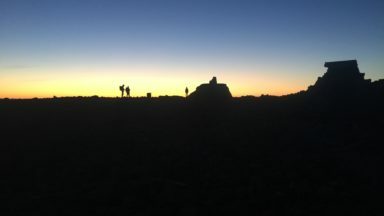 What started life as a niche within the already-niche ultralight US backpacking scene has blossomed in recent years into an activity in its own right. The love child of trail running and overnight backpacking, it's all about adventurous runners going fast, light and self-sufficient on multi-day mountain journeys. We're not talking races here - fastpacking is nothing to do with competition but all about the experience. This attractive little pocket guide from Brecon Beacons-based runner Lily Dyu is an excellent introduction to the discipline. Kicking off with tips on gear and general approach, it then launches into a series of stories from the trail which aim to inspire as much as inform. 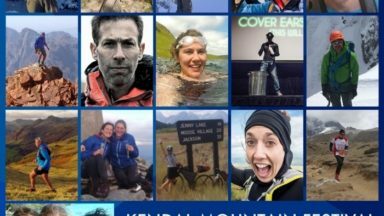 Jasmin Paris and Konrad Rawlik take on the Pennine Way in winter, just for laughs; Jez Bragg goes hut-to-hut around Monte Rosa; Anna Frost leads a running group through Bhutan. It's interesting stuff, and sure to give you itchy feet. By way of scratching that itch, the book concludes with 12 largely UK-based fastpacking route ideas, each of which gets quality mapping, a detailed description and its own 'tale from the trail', a short narrative account that gives a good idea of the experience to be had. These mostly seem a suitable length and difficulty to be run over the allotted timeframe with overnight gear on your back, though a 15km 2-dayer in Dartmoor did stand out as slightly unambitious (it's a route I'd expect to slow-walk in about 5 hours). Whether you're a backpacker looking to up your pace (and fast doesn't imply running all of it!) or a runner in search of bigger adventures, Fastpacking is a great place to start. A book after our own heart here at Trail Running. 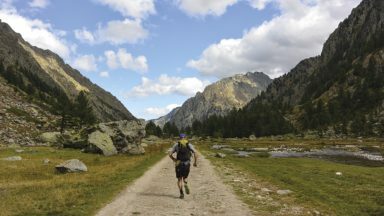 It’s devoted to inspiring you to run some of the most amazing long distance trails here in the UK or further afield in amazing locations in the Alps. Fastpacking is all about covering distance at speed, carrying everything you need for such an adventure. The runs have all completed by some pretty handy trail runners, so all you need to worry about is the weather! There’s everything you need to know from where to find local Eccles cakes to perfect campsites or mountain huts to set up camp in on your journey. Produced by Cicerone, this is superbly written book by great experts who know what the reader needs. Not for nothing Cicerone leads the way in this market and is regarded as the authority to turn to in when it comes to mapping out adventure runs and inspiring walks worldwide. ...spells out what gear you need, where and how to do it and most importantly, why you'd do it. Some excellent suggestions for fastpacking adventures, and nice little vignette stories from past adventures. A great gift for any adventurous runners. Exactly the mid-autumn motivation boost I was hoping for! Part guidebook, part adventure stories this little book will give anybody who likes long running journeys a pile of inspiration. The stories are brief but give you enough to make you want to head there yourself, the route suggestions give accurate route descriptions, distances and tips. Would be a great gift for any adventurous runners.